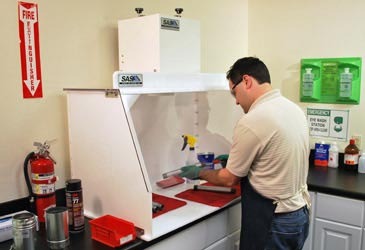 Chemical Fume Hoods - Sentry Air Systems, Inc.
Sentry Air Systems’ Chemical Fume Hoods are designed for the ventilation and purification of hazardous compounds found in chemical fumes. These high-quality hoods are designed for operator protection and are equipped with a powerful fan and a variety of HEPA and Activated Carbon filters for optimal efficiency in capturing harmful fumes and volatile organic compounds. These systems are recirculating, so they do not require any ducting or make-up air [Ducted Fume Hoods are also available]. Typical applications for these units include solvent-based cleaning or rinsing, formaldehyde fumes, epoxies and resin odors, plastic bonding and gluing, melting plastics, acid etching and a variety of applications involving chemical fumes and dusts. 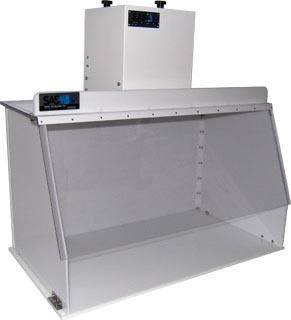 Chemical Fume Hoods are available in the following standard sizes: 12”, 18”, 24”, 30”, 40”, 50”, 60”, and 70” Wide. Custom sizes and modifications are also available. 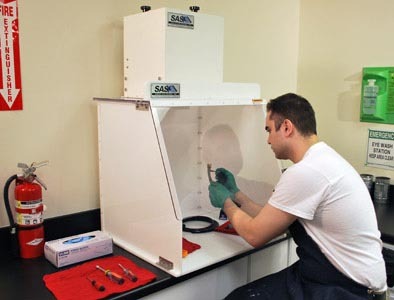 The consultation and design of custom fume hoods are available services at Sentry Air Systems and several hood material options are available to accommodate specific chemical use. Sentry Air Systems’ in-house Chemical Engineering team has performed numerous filter and unit efficiency tests involving chemical fumes, including Acetone, Xylene, Methyl Ethyl Ketone (MEK), Toluene, and much more. You can find the results of these tests and many other efficiency tests on the Data Page of our company website.